1) You can use Users Section to add other users to your blog and control the level of permissions you wish to grant them. Once you add a user by putting their email in the appropriate field, an email will be automatically sent to them asking if they want to accept the invitation. 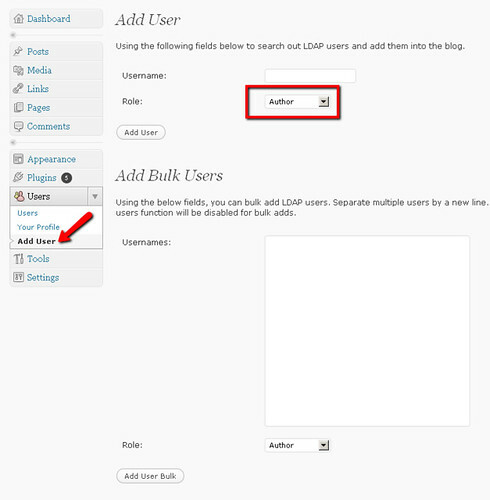 Keep in mind that a user must be a member of Longwood Blogs already for them to be added to your blog. Once an invited user accepts the invitation, they will show up as a user within your blog with the permissions you specified. 2) If you are thinking about creating a group blog, you can go to the administrative back-end of your blog, and navigate to the Appearance >Widgets sub-tab. Widgets allow you to customize your sidebar. Add the widget titled “Add Users” (you may also want to add widget like recent posts, recent comments, meta (which is the log-in link) and anything else that catches your fancy. Also, you can drag the widgets to arrange them as you see fit. After that, you should edit the add users widget (click on the edit button) and make it so that those who are added are authors, and no password is required nor a preexisting list of emails. Then save the new sidebar settings. Tell the potential authors they need to log in and then navigate to your blog and click on the “Add Me” button in the sidebar of your blog and immediately have privileges to post on your site (if you are already logged in as an author, you won’t see the “Add me” button, but a Welcome, Jane Doe message). Users who add themselves to your blog will not have administrator privileges, just permissions as an author and will be able to write posts.